Natick – Robert Andrew “Robbie” Skog, 50, of Natick, formerly of Westborough, passed away July 29, 2018. He was born Sept. 2, 1967 in Worcester. Robbie is survived by his mother, Paula Skog of North Grafton; his sister, Kelli Silva and her husband Brian; and his beloved nephew and niece, Lucas and Victoria of Westborough. He also leaves behind many aunts, uncles, cousins, and friends. He was predeceased by his father, Robert Skog, and his paternal grandparents, Earl and Anne Skog, and his maternal grandparents, Donald and Margery Haynes. Robbie was born with Cerebral Palsy and severe intellectual and developmental disabilities. 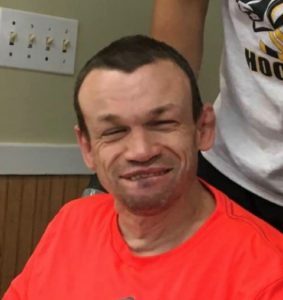 Despite his severe disabilities, he was able to have a wonderful quality of life because of the dedication of his mother combined with the amazing staff at Advocates Inc., Robbie’s group home at West Hill Park in Natick, and his day program, Price Rehab in Newton. We want to thank David Thuku, and all of the wonderful staff that have cared for him over the years. A special thank you, as well, to Tony, Mike and Melissa at Price Rehab for your compassion and patience with Robbie over the years. Every single one of you who worked with Robbie is a truly caring person. Robbie was a special person who touched everyone who knew him. He loved food of any kind, but especially butter cookies, country music, walks outdoors, the water, silly noises, and hugs. He had a beautiful smile and laugh that will be missed by all. A calling hour will be held Saturday, Aug. 11, from 10-11 a.m., at the Pickering and Son Westborough Funeral Home, 62 West Main St., Westborough, with a private service and burial to follow for family and friends. In lieu of flowers, donations may be made to Advocates Inc., 1881 Worcester Rd., Framingham, MA 01701 (www.advocates.org) or The Price Center, 27 Christina St., Newton, MA 02461 (www.thepricecenter.org).